Browse: Home / Publications / Organise! 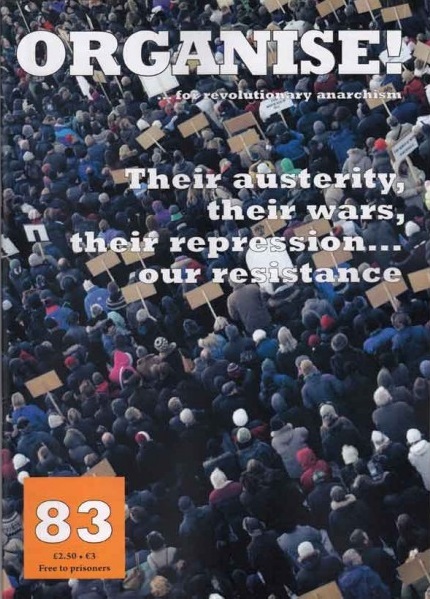 MAKE SPACE FOR RESISTANCE Fighting for our environment, struggling against nationalism & reformism, understanding the workings of austerity PLUS analysis, reviews, our regular culture feature, and much more. WHOEVER IS ELECTED CAPITALISM WINS. 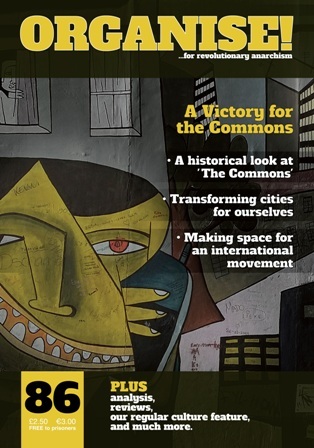 Pre-election contents: Cities public housing and social cleansing, Anti-cuts movement analysis, Analysis of war arenas including Libya and Middle East, Kurdish struggle in Rojava, Election balls, Suffragettes & Sylvia Pankhurst on Parliament, Report from AFem 2014, plus culture, reviews and obituary. THEIR AUSTERITY, THEIR WARS, THEIR REPRESSION … OUR RESISTANCE. Chinese workers’ struggles, Arab Summer, Morocco & Eqypt, new Caribbean Anarchist Federation, Slovenian anarchist interview & Balkan bookfair report, Iceland, French 19th C. silk workers revolt, Frans Maserreel anarchist artist. WHERE FROM HERE? Crisis on the Left, crisis in the Anarchist Movement, The Politics of Malatesta, Platformism and the “Fontenis Affair”, The Life of Omar Aziz, The Zoot Suit as Rebellion, book reviews.